The Kyle Counter Stool sits at the traditional 26’’ seat height and is designed to slide under your standard countertop. The Kyle Counter Stool features no armrests so that it may easily slide under your tabletop to save space during non-use. 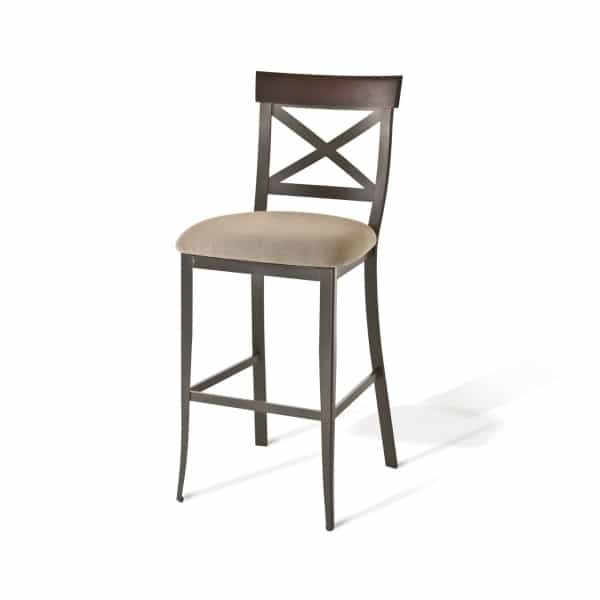 The Kyle Counter Stool features the down-to-earth, classic aesthetic that Amisco masters with its countryside-style line of bar stools. The Kyle Counter stool is built with a steel frame, a wood backrest, a plush cushion and durable fabric covers the cushion. The frame is steel but may be finished in different down-to-earth colors, as pictured here. Then, it’s coated with a powder-baked coating that prevents unwanted scratches from affecting the surface. The cushion cover is also customizable, and Amisco provides a large selection of fabrics that range from solid colors to whimsical designs. If the structure of the Kyle Counter Stool would integrate into your space, check the selection of finishes and fabrics for the perfect combination.